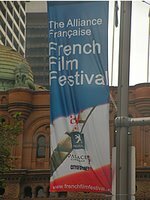 Ah, one of my favourite times of the year - the French Film Festival. The streets of the city are lined with red white and blue banners. This year has a very good line-up and I've had to have a lot of restraint (thanks to time and budget) to not see everything. French film festival sounds bien! excellent, can't wait for your reviews ! will refrain from comments/ possible spoilers until you've seen the films... must just say though, my 2 favorite Charlottes are in Lemming and it's well worth seeing it if only for the actresses. Hey, I've been reading your blog for a few months now, but this is the first time I've posted -- I enjoy catching up with what's going on Down Under, as I often wonder how my Australian friend from college is doing... We both studied in Paris together for a semester. I've been in love with French culture for more than half my life, and now I actually live in France, just outside of Paris... Long story! In any case, your life sounds so very glamorous, and I live a bit vicariously through your posts! You have really good taste, and a lot of what you have to say really intrigues me... And the restaurants there in Sydney sound so wonderful, sometimes what you had to eat makes my mouth water! Anyhoo, just thought I would mention it! Enjoy the Film Festival, sounds fab!